I'm officially new to the forum, but I've been "lurking" for a couple years. 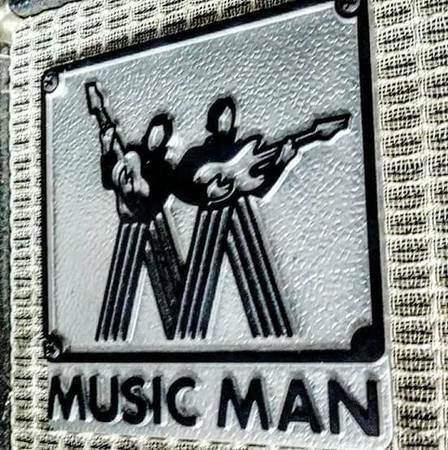 As a hobbyist restorer, I've been frustrated by the difficulty of locating Music Man amp/cab badges... So I finally took the bull by the horns and produced my own castings. I have the large cab MM logo, the small amp MM logo, the RH 115, and the HD 130 Reverb. Happy to make these available to others interested...photo of a large logo attached. Maybe check in with Ernie Ball? Although this is perfectly legit for personal use.... if you are wanting to offer these to others you may want to check in with the Ernie Ball company (the company that owns music man) and get permission. I would hate to see you get yourself in trouble over a piece of plastic. By the way, the badge looks great! ive read several threads on the forum discussing the frustrations associated with finding these items- except for the occasional resale on E bay. A plastic replica of a long- discontinued part is not an unusual thing ( I've purchased dozens of examples of reproduction Fender amp parts available on commercial websites). If addressing a need long-ignored in the marketplace prompts EB to introduce the real thing, so much the better. Meantime there's now an alternative available for those interested. Thanks for the compliment on the badge! I need both badges for my HD 130 combo. I live in Scotland! Hello. I am looking for the large black with silver background just like the one in your photo? Are these still available? Thank you! Yup, I have a few... Send me a message for details. Hi, Do you still have any of the large cabinet badges left and would it be possible to post to Australia? Do you have these two logos available? Sorry I missed your response. I do still want one if available. Thank you! 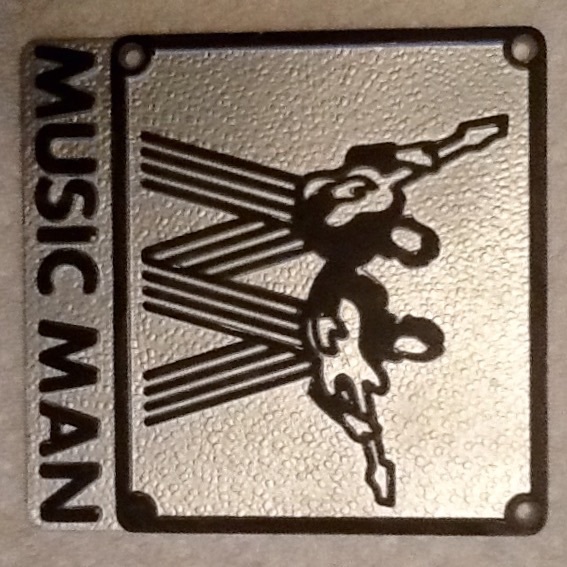 Do you have anymore of the Music Man logo badges available? My RD100 was missing the logo when I bought it and I've been looking everywhere for a replacement. Thanks. I can reproduce small or large logos in either original (black on silver) or post-Ernie Ball (silver on black) color schemes. If you have these available or just a plain badge, please let me know how to order. 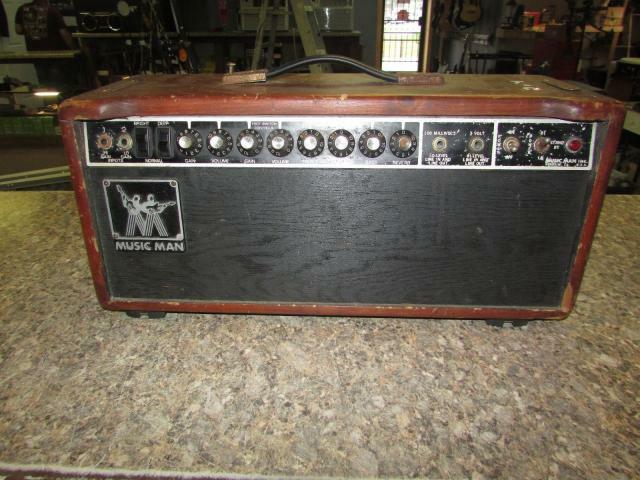 Hi, Amp Craftsman 86, I would like to get the MM logo and HD 130 reverb badge? oh please help me! I need some badges also. Need the MM badge for a sixty five 210... any help? May as well get the 210 badge to match... PLEASE. Can you please tell me the price for each, delivery in Portugal? Can you make a model badge for an RD 2100 head - just bought it and going to restore it? Its ugly now but soon will be looking good - also needs to be silver on Black BG to match larger badge. That's gonna be a beautiful amp head when you're done... unfortunately I cant produce a model badge for the lower right. Good luck and post pictures when completed! 70's MM large logo needed for Sixty-five 210 amp. Do you have an order page? The logo badge shown on the upper left hand corner is a cheap plastic replacement. Yeah... looks like someone stuck a small 80's badge on your 70's era amp... I messaged you with info. BUT- bear in mind that my reproductions are resin-cast from molds taken from original parts... I don't want anyone to think I am casting in metal as the original MM logos were. Can I "Borrow" a badge? 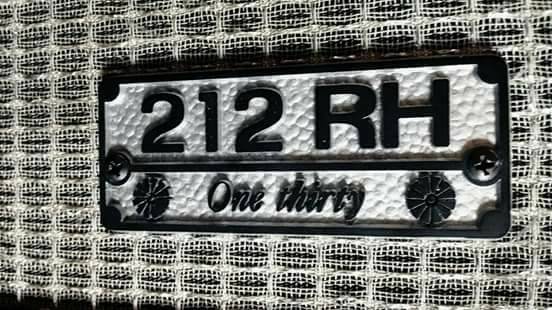 Hey All- I've been looking for a 212RH (reflex horn) badge to make a mold so I can cast one for my cabinet... The mold process does no damage in any way... If anyone would be willing to send me the part, I'd gladly pay shipping both ways and provide some badge castings or cash in return....I can produce large and small logos as well as HD130r and 115RH badges. Hi I would need one large logo badge (like the very first pic you posted) for my 1975 HD130 410 combo. Would you happen to have the "410-HD one thirty" that goes in the inferior right corner by any chance? I'm in Montreal, Canada. Thanks! I am interested in Music Man badges for 410HD. Just received my replacement badge from Amp Craftsman today and got it installed. Couldn't be happier with the detail and finish. I have included a pic, one showing old and new side..
Hi - I'm seeking a 112 RP Sixty Five (lower right-hand corner) badge. Have you done any of these, by chance? Sorry mjet.... I don't have a mold for that one! 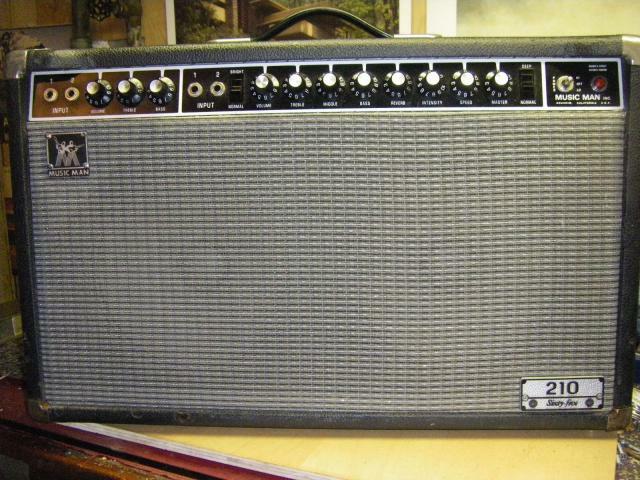 I have an amp like that. With the original logo in fine condition. Do you have any of these for sale? Missing a corner badge for my 100 RD I'm restoring. I've found a pic online of what it looks like. Might you have any reproductions of these? I don't have a mold for that one... I'll keep an eye out, though. Good luck on the project!